After having several extra days off during the week for Bookman’s birthday and enjoying time in the garden and a good dose of pure laziness, it is hard to think about putting a blog post together and that I have to return to work tomorrow. It seems to me the more time I spend in front of a computer, the more time I spend looking at a screen even when I don’t have to and the more time I spend doing other things, the less time I spend looking at a computer screen. I realize I really enjoy not spending a lot of time in front of a computer even if I am not busy doing much of anything other than staring at the wall. But computer time begets computer time and I spend my days at work in front of a computer. Barring very early retirement or managing to become a full time gardener, I am doomed to be a computer slave. Sigh. I read a really good gardening book this week called Hellstrip Gardening: Create a Paradise Between the Sidewalk and the Curb by Evelyn J. Hadden. She discusses the challenges of gardening in this no man’s land and offers ideas for how to cope with those challenges. My challenges are poor soil and several feet of snow mixed with salt and deicer that gets plowed up from the street every winter. So far I have two small beds in this area of my yard. They were so hard to get going too but after years of trying and killing large numbers of plants I have found a number that thrive in the badlands. I have space for two more beds and have been trying to figure out what to try and now I have some great ideas thanks to this book. If you are looking to beautify your own hellstrip, get your hands on a copy of this book for some great ideas and inspiration. we set it all up and were happy. Lesson number one: never set up a solar pump on a mostly cloudy day. The sun came out very late in the day but we did not notice anything amiss until I walked by the pond on my way to the bus the next morning to discover it was empty. What? How? Bookman filled the pond up before going off to work. When I came home that evening of a very sunny day, I checked on the pond. Empty again! But, I noticed the ground on one side of the pond was kind of damp. Can you figure out what happened? Since we adjusted the pump and the little fountain nozzle when it was cloudy, when the sun came out and the pump and fountain were going full force, it shot up and sprayed all the water out of the pond. I am only sorry I never got to see it happen. We refilled the pond, shortened the fountain stem, and while it was sunny, adjusted it all so the water just burbled at the surface of the pond. Oy. Then we had a raccoon visit again. And now the pump has decided to stop working and we don’t know why. I can’t find that the raccoon chewed anything on the wiring or broke the pump, so it is a mystery why it suddenly stopped working. On the positive side, in spite of the raccoon and the pond being drained to within an inch of empty twice, there is still one, hardy goldfish keeping things mosquito-free. That survivor goldfish is my hero. Now, I was hoping to reveal something super fun, a repurposing of the Doctor Who salt and pepper shakers we found earlier in the week, but since the pump has decided to stop working the project is postponed. The plan, when it all gets up and running again, is to turn the Tardis into a tiny fountain. 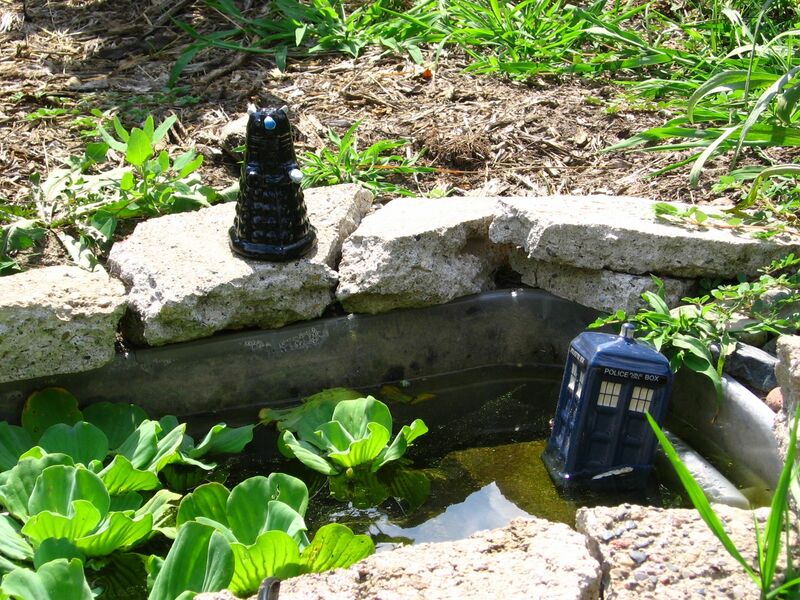 At the moment it is just sitting forlorn in the pond with the dalek looking on. Exterminate! Exterminate! We’ve had a couple of hot, dry days and the peas are definitely done now. Very happily I got almost as many peas this second time around as I did the first. So tasty. I will miss you fresh peas. The beans are still going and now the zucchini is too. We had zucchini “noodles” with a spicy peanut sauce earlier in the week this evening we are having breaded zucchini along with some salad. The zucchini is ramping up its production though so soon we will be frantically making and freezing zucchini bread and trying our hand at making zucchini relish as well as drying a bunch to try in soups over the winter. everything. 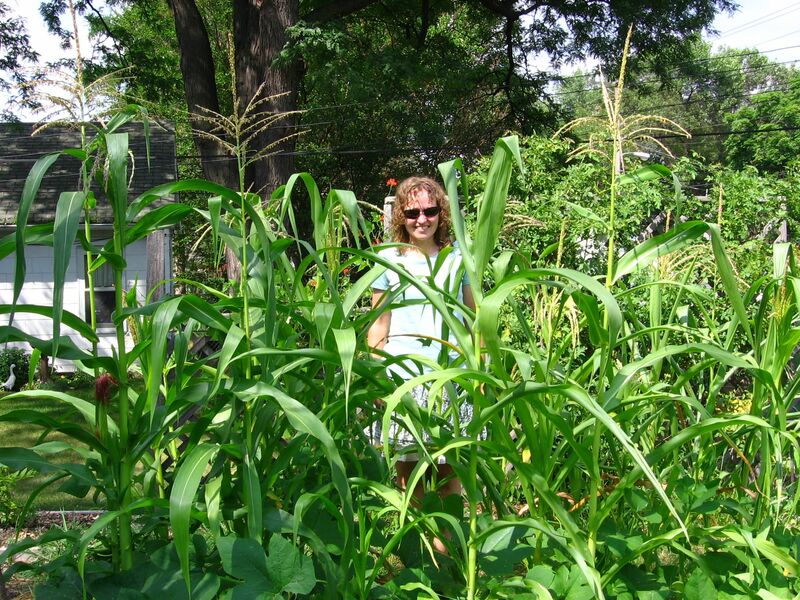 And the corn, well, two weeks ago it was chest high on me and now it is taller than I am. We have decided that once we get ears of corn, we will put nylon stockings over them to protect them from critters. Hopefully that will work. We just came up with the idea ourselves and I haven’t gone looking to see if anyone else has tried it with success. I probably should do a bit of research before we go and buy a bunch of cheap stockings at the drugstore. This week I have a video for you of the anise hyssop and all the bees buzzing on it. You will also see a red admiral butterfly. We have had a huge swallowtail butterfly visit it a number of times but it was not present when I took the video and when it did drop by and I ran out with my camera to try and get a photo I was too fussy trying to get a good angle and a decent close up and it flew away with me yelling “please come back!” after it. Oh well. The red admiral still came by and looks lovely as do all “my” bumblebees. Enjoy! Oh no! Sorry about your fountain and pump spraying the water out of Amy pond and then not working. What a good thing it is that the goldfish is happily taking care of those mosquitoes. I’ll keep my fingers crossed that it can be fixed. Your corn is rapidly growing! I bet you can taste those kernels already. I never heard of using hosiery to cover the ears. You’ll have to keep us updated if you decide to do that. I decided I am hiding our pumpkin seeds from my husband next year. He went bananas with planting them and they took over the garden and even grew up over the dill and asparagus. I can barely get to the zucchini plant to cut zucchini. I feel as if I’m in a jungle of sorts. Vanessa, well we knew the pond would be an experiment this year, we just didn’t realize how much! Oh yes, there are tiny ears on some of the cornstalks already and we are so excited about them! I will let you know what I learn about hosiery and whether it works! Two things in your posting caught my eye (other than all the other cool things you had to report): hellstrip gardening and pumpkins. A pumpkin is growing in our sidewalk tree pit! 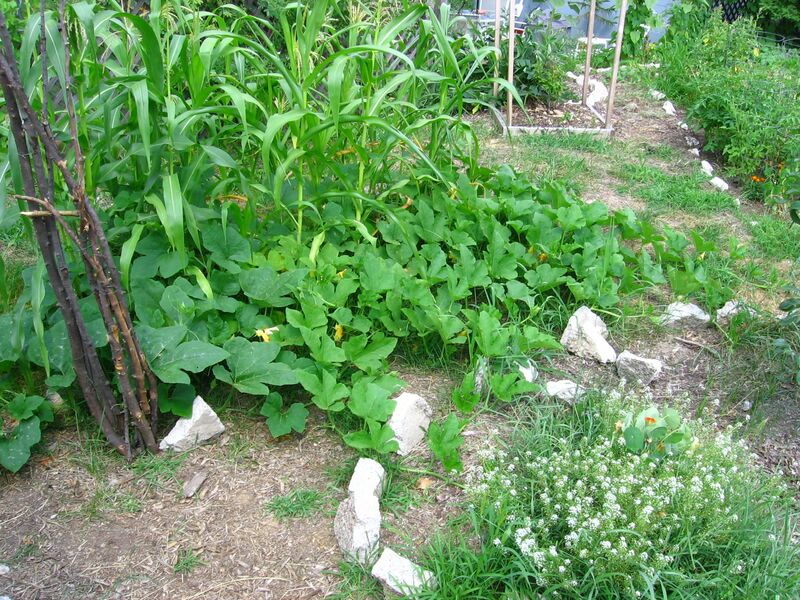 I almost pulled it out as a weed, but, just in time, I recognized the leaves as a squash or pumpkin. I imagine it got there when some lovely soul smashed a pumpkin last Halloween, but who knows? And I can’t let myself get too excited because I’m sure a drunk from South Street will rip it out one night. Last weekend they tipped over one of our potted trees. City living! Joan, a volunteer pumpkin, what fun! I do hope no one rips it out or takes the pumpkin once you have them. Perhaps it is a magic pumpkin vine that will survive the indignities of a public city street! How I loved your video. Cath, I am so very glad! The things you have to do to keep your veggies from critters in the garden! Nylons, eh? Will they be fishnet? Just kidding…. Blame any problems on the raccoons. They may not have done it, but don’t they just look guilty in any case?! How cool you will have pumpkins (for carving or for pumpkin butter? ), and I hope you manage to salvage as much corn as possible–that sounds yummy! How are the gooseberries? I am looking forward to the video–which I will watch when I’m at home and have sound! Danielle, LOL, fishnet with some rhinestone bling for sure. Only the best for my corn! 🙂 The pumpkins are for eating. They are New England pie pumpkins, an heirloom variety I’ve not grown before. They are supposed to be creamy and sweet. We love pumpkin so much they mostly get gobbled up in pies and muffins and pancakes but I planted so many this year perhaps I will have enough to make some yummy pumpkin butter. Did I forget to tell you about the gooseberries? They are finally ripe. I know because something ate every single one of them! Its odd to think that in an early stage of my career I actually was forced to go on strike when the management of the newspaper wanted to introduce computers and journalists thought we should have a salary increase for using them. I so wanted one – it would be much easier than using the sit up and beg Remington which took a lot of power to get those keys working. Now, like you I long for a time when I don’t need to use one……. BookTalk, computers are both a blessing and a curse, aren’t they? They make so many things easier but insinuate themselves into our lives until they start to take over. I seriously consider buying myself a manual typewriter sometimes while I still can! Such a happy post! I love the Doctor Who idea!! wherethereisjoy, gardening makes me happy! Hopefully the Who plan will work out. My goodness, I tried to grow anise hissop from seed this year and my poor weedy specimens are nothing in comparison to your glorious bush of it – wow! Most impressed!